So you didn't get your tickets to the ever popular and now sold out Donut Fest at the Chop Shop this weekend? Don't fret. Firecakes Donuts, the judges' choice winner of the 2015 competition, will be offering its first fifty customers a free taste of their award-winning Tahitian Vanilla Glazed Donut Mini, this Sunday, January 31 at both locations, 68 W. Hubbard, and the newly opened shop at 2453 N. Clark St.
On Sunday, January 31, Firecakes will again be competing at the 2016 Donut Fest, showcasing their newest creation (available at the Clark St. shop only), the Maple Glazed Candied Peppered Bacon Long John filled with Maple Cream. Donut Fest is a celebration of the love of fried sugary dough with a competition of yeast, batter-y, deep-fried treats. The best restaurants and bakeries in each city (it's held in Chicago and New York) submit their best cruller, ring or long-john and compete against each other, with only one walking away with the coveted title of "Best Donut." Donut Fest Chicago returns to Chop Shop for their third year, complete with two sessions (9 a.m. to noon) & (2 p.m. to 5 p.m.) this Sunday, January 31. Firecakes Donuts, serving artisan donuts that are freshly made in small batches on-premises using the finest ingredients, are located at 68 W. Hubbard in River North and 2453 N. Clark in Lincoln Park. The Firecakes "Billy" Donut Truck can be found at various times throughout Chicago. Lincoln Park store hours are: Sunday through Thursday 7 a.m. to 9 p.m.; Friday and Saturday, 7 a.m. to 11 p.m. Hubbard Street Store hours are: Sunday through Wednesday, 7 a.m. to 10 p.m.; Thursday through Saturday from 7 a.m. to midnight. Firecakes Donuts also operates a Donut Truck, which can be found in the Loop on weekday mornings and, in season, in the evenings and on weekends at various neighborhoods around Chicago. The Donut Truck also can be booked from private events and catering; please call 312-329-6500 for more information. Delivery, catering and pre-orders are available. Please place orders by 3 p.m. for next day pickup or Chicagoland delivery. Firecakes also serves a giant birthday cake donut that serves 2-3 people and an ice cream donut sandwich. Firecakes Donuts serves coffee from La Colombe Roasters. Major cards are accepted. For more information, please call the stores at 312-329-6500 (W. Hubbard St.) and 773-666-5277 (N. Clark St.) or visit the website at http://firecakesdonuts.com. Follow Firecakes on Facebook (www.facebook.com/FirecakesDonuts), Twitter (http://twitter.com/firecakesdonuts), and Instagram (www.instagram.com/firecakes). FUTURE SO BRIGHT is showcased in the Old Courthouse Arts Center located in Woodstock, IL. technological innovations of the 20th & 21st centuries. American Icon examines the world's perception of America. It combines quintessential American imagery to create a depiction of this nation as seen through the eyes of the world. From the Founding Fathers to Facebook, Cowboys and the Wild West, Mickey Mouse to Marilyn Monroe, Google, Apple, Microsoft, Twitter, Skyscrapers, the First Women's Rights Movement and the First Man on the Moon. America is seen as the Golden Door of Opportunity. Throughout much of the nation's history, citizens of other countries have marveled at the prospect of American freedom and opportunity. They left their homelands in pursuit of stability and brighter futures for their families. These immigrants have shaped American development and have characterized the nation as an amalgamation of cultures and traditions. "American Icon" pays tribute to the people, innovations, and imaginations that have shaped this nation's history. The exhibit will be in the Old Courthouse Arts Center, located on Woodstock's historic square, NW of Chicago. You may recognize the square from the film Groundhog Day. This is a national exhibition with national and international guest artists. 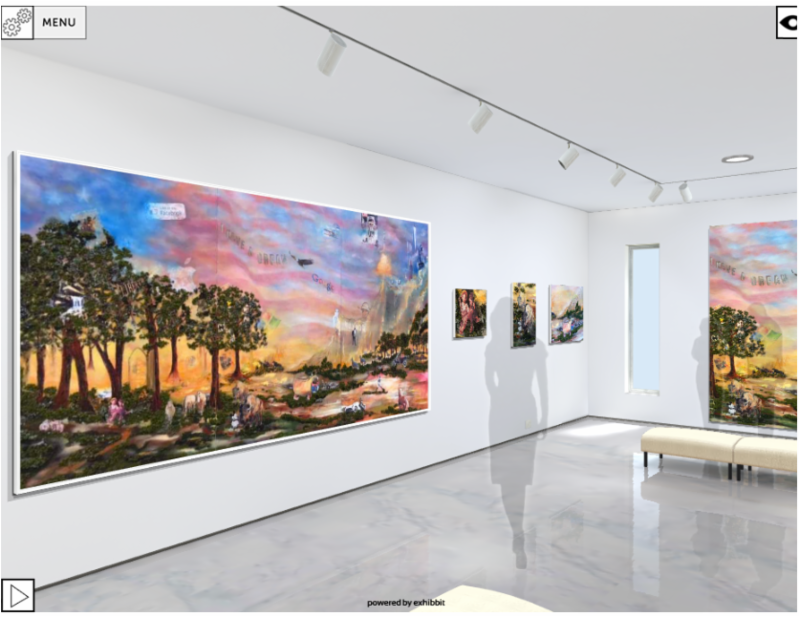 Some of the work featured will be interactive and technology-based Artwork created using traditional mediums, which express a modern theme are included also. The show includes museum exhibiting, mid-career & emerging artists. The exhibition is open January 30 - Feb 27. *Complimentary food will be served and a cash bar will be available to purchase drinks. Virtual Gallery tour of American Icon below. Click here to view. The Gene Siskel Film Center (GSFC) of the School of the Art Institute of Chicago (SAIC) has received a generous $194,280 grant from the Chicago-based Reva and David Logan Foundation. This three-year grant, to be applied in 2016, 2017, and 2018, will support the GSFC’s audience development initiative to engage the Latino community in its film programming. The grant funds will cover the areas of advocacy, programming, partnerships, and emerging local filmmakers. “In our efforts to attract an audience as diverse as our film programming, we are grateful that the Reva and David Logan Foundation has awarded the Gene Siskel Film Center this generous three-year grant to engage the Latino community. We want both the community and the city to identify our movie theater as their Film Center, and work to ensure that our world-class programming is relevant to them and their community. Our international cinema offerings in particular are curated to connect individuals to their culture and to broaden one’s worldview—and most importantly to bring people together for high-quality entertainment,” said Gene Siskel Film Center Executive Director Jean de St. Aubin. The initiative will support advocacy by hiring an outreach consultant with a deep understanding of and strong ties to Chicago’s Latino community to forge partnerships with key cultural organizations, Latino media, private and public high schools, and Chicago Public Library branches serving Latinos in order to introduce them to GSFC programming both at the movie theater and within the community. The goal is to minimally increase the GSFC’s Latino attendance by 11% and to grow its Latino Advisory Board participation by 2% in the next three years. Latino programming is already in effect, showcasing the latest movies—as well as historically significant cinema—from the Latin world, listed below with these examples. - The initiative kicks off with the current Academy Award nominee for Best Animated Feature, Boy in the World (February 5-11), which concerns Everychild boy, a vulnerable stick-figure who journeys from the peaceful countryside to the chaotic city in search of his father amid Brazil’s working poor. - Beginning in the fall of 2016, the Gene Siskel Film Center will present its 14-week lecture series, Latino Film of the 1980s: Dystopia to Hope (dates TBA), featuring SAIC Assistant Professor Daniel Ricardo Quiles as lecturer. The lecture series is open both to the public and to students through SAIC’s Department of Art History, Theory, and Criticism. Another curatorial initiative—using the GSFC’s already successful and acclaimed Black Harvest Film Festival as a model—will be programming to support independent Latino filmmakers so that their stories, voices, and visions may come to life on the big screen. to learn more and find out what’s playing today. Valentine’s Day is just around the corner and whether you’re celebrating with a long-time love, new partner (or someone you just met on a dating app) make it extra sweet with a treat from Floriole Bakery & Café. Husband and wife team Sandra & Mathieu Holl have created a series of extra special, extra decadent desserts for Valentine’s Day. Chocolate lovers will go crazy for Floriole’s rich Chocolate Ganache Soufflé Cake while those who prefer something lighter can opt for Hazelnut Linzer Heart Cookies filled with Raspberry Jam. Conversation Heart Cookies that resemble the classic Valentine’s Day candies will feature fun saying and expressions of love. Guests looking for something a little more exotic will love the Milk Chocolate Mousse, which looks like a mini cake. It’s filled with a gooey Passion Fruit Caramel center and topped with Passion Fruit Cream. Looking to make your Valentine’s Day as easy as possible this year, Floriole has teamed up with Fox Glove Studio to offer hand-tied bouquets at the bakery on February 14th. For more information please contact Samantha Crafton Public Relations directly. High resolution images are available upon request. About Floriole Bakery & Café: Chicagoans were first introduced to the decadent French pastries of Floriole at a small stand within the city’s beloved Green Street Market. Co-owners Sandra and Mathieu Holl opened a brick-and-mortar location in 2010, which features an expanded menu that includes salads, sandwiches, breakfast items and even more pastries. The seasonally driven menu is created using ingredients like organic flour and sugar, European-style butter, Valrhona chocolate and cage-free eggs. Most produce, meats, and cheeses are sourced directly from sustainable farms within the region. Highlights from the current menu include a Twice-Baked Almond Croissant soaked with Rum Syrup and filled with Almond Cream, a Buckwheat & Oat Scone served with House Jam, a Maple Pecan Cookie Flavored with Orange and a Parisian Sandwich made with Smoking Goose Ham, Raw Milk Cheddar, Butter and Old Fashioned Mustard served on a Baguette. Guests flock to the Lincoln Park bakery café for the crave-worthy food as much as they do for the genuine hospitality and comforting ambiance. High ceilings, large windows hardwood and brick throughout give the space a bright, airy and slightly rustic feel. With accolades that include Top 10 Bakeries across the U.S. (Fodor’s Travel) and Top 10 Baguettes in America (Bon Appetit magazine,) it’s clear that Floriole has carved out a very special place for itself not only in the hearts of its patrons but within the industry as well. Floriole is located at 1220 W. Webster Ave. They are open Tuesday – Friday from 7:00 am – 5:30 pm and Saturday – Monday from 8:00 am – 5:30 pm. For more information, high resolution images or to speak with co-owners Sandra and Mathieu Holl, please contact Samantha Crafton Public Relations directly. by John Garofolo — a starred review stating, "[Chappelle’s] body of work surely deserves the wider recognition this book provides,” while Foreword Reviews said, "A fitting tribute to a fearless female war photographer.” In Dickey Chapelle Under Fire [Wisconsin Historical Society Press], Iraq War veteran and former entertainment industry executive John Garofolo provides a closely researched, incredibly comprehensive, and never-before-seen look at the work and life of Chapelle. An inimitable woman who defied convention every step of the way, her courage, work and spirit deserves recognition by every man, woman and child in America in the same way as Amelia Earhart. Dickey Chapelle Under Fire is a poignant hardcover, containing over 150 arresting black-and-white photographs, many of which once graced the pages of National Geographic, LIFE, and others. Peppered with excerpts from Chapelle’s compelling diaries and other remarkable stories of life on the front lines, Dickey Chapelle Under Fire follows Chapelle as she abandons her studies at MIT, marries, and persuades the Navy – despite objections from every side and, at the time, meager credentials – to let her cover the front lines in the Pacific. From Iwo Jima to the Hungarian Revolution of 1956, Chapelle overcame gender bias, a cheating husband, and ultimately earned the respect of the military and her media peers… in pearl earrings and cat-eye glasses, no less. With an emotionally-charged and eerily timely foreword from former Washington Post war correspondent Jackie Spinner, Dickey Chapelle Under Fire highlights the human impact of war while telling the bigger story beyond the battlefield – and is a not-to-be-missed volume for military history buffs and civilians of every age and from every walk of life. John Garofolo is a screenwriter, college professor and former entertainment industry advertising and marketing executive. A veteran of the Iraq War, Garofolo provided security and escorted members of the international media into Iraq during the initial phase of the war, and is currently a Commander in the U.S. Coast Guard Reserve, on active duty assigned to Coast Guard Headquarters in Washington, DC. He is the author of Dickey Chapelle Under Fire: Photographs by the First American Female War Correspondent Killed in Action. , and in all North American brick-and-mortar book retailers. , at the Fairmont Chicago Millennium Park on March 5, 2016. Camp Kesem is a nationwide community, driven by passionate college student leaders, that supports children through and beyond their parent’s cancer. With over 3 million children touched by a parent’s cancer in the United States, Kesem is the only national organization dedicated to this unique population. For many children their Camp Kesem experience is a life-changing event - providing them a community of children with similar experiences, and a safe and welcoming environment to have fun and rediscover their childhood. In Summer 2015, 5,000 children attended over 70 free week-long sessions of Camp Kesem held at fun and exciting campsites from coast-to-coast. Having expanded its service reach by four times in the last five years, Camp Kesem is now represented by 73 chapters in 34 states, and hopes to serve 6,000 children in Summer 2016. Locally, Camp Kesem supports the Illinois community with chapters at Northwestern University, University of Illinois, and Augustana College - and will further support the community with new chapters at DePaul University and Northern Illinois University come Fall 2016. The second annual The Magic Ball will be a unique blend of fun, magic, surprise, fantastic food and entertainment to help spread the word about the magic of Camp Kesem and the difference the organization has made for so many families. Last year’s event attracted 580 guests for a memorable and impactful evening that raised over $725,000. The Magic Ball is sponsored by a number of leading Chicago businesses and organizations, including Event Sponsors, Giordano’s, Victory Park Capital and The Walter C. Hagen Cup. The event will be hosted by Susanna Negovan, creator of SPLASH by The Chicago Sun-Times and contributor to FOX Good Day Chicago. This year’s event will feature a dinner, program and dancing. The Camp Kesem live auction will feature one-of-a-kind experiences like sport packages from the Bulls and Bears, once in a lifetime adventure & dream vacations, celebrity chef dinners, and so much more. "The Chicagoland community has always been so incredibly generous in supporting our mission, and we hope to bring new eyes and ears to our cause by introducing this brand new event. The Magic Ball will be a unique, fun-filled, and unforgettable night that will bring the magic of Camp Kesem to life for our guests and help move us closer to our goal of serving 6,000 children this summer,” says Jane Saccaro, CEO of Camp Kesem. Sponsors include The Pritzker Pucker Family Foundation, Giordano's, Victory Park Capital, The Walter C. Hagen Cup, Goldman Sachs, the Malkin Family, Boeing, Katten Muchin Rosenman LLP, Merrill Lynch Private Banking & Investment Group, Ventas, the Agnew Family, BMO Harris Bank, Constellation Brands, Deloitte, Duff & Phelps, FlexPrint Inc., The Frances E. Streit Foundation, GCM Grosvenor, the Higgins Family, the Hutchen Family, The Keckley Company, KPMG, Latham & Watkins LLP, Navigant, RR Donnelley, and West Monroe. Beverage Sponsors include Beam Suntory, Magic Hat Brewing Company, and Southern Wine & Spirits. Sheridan Road Magazine will serve as North Shore Media Sponsor, and SPLASH is the Print Media Sponsor. The 2nd Annual The Magic Ball will be held on March 5, 2016 from 7 p.m. to midnight at the Fairmont Chicago Millennium Park, 200 North Columbus Drive, Chicago. Individual tickets are $250; Sponsorship opportunities are available starting at $2,500. Tickets must be purchased by February 18, 2016. For more information, please visit www.themagicball.org. , Facebook.com/CampKesem, and @CampKesem on Twitter & Instagram. From house fires to science experiments, car accidents and even abuse, the pain never stops for girls with severe burns or disfiguring trauma. For years after they leave the hospital, the staring, name-calling, teasing, and unwanted questions from their peers create a sort of living hell. Each summer, adolescent girls struggling with this unfortunate reality can attend a special retreat designed to inspire and nurture them to process their injuries and losses and reach their fullest potential. Angel Faces®, the California-based nonprofit that organizes and runs these retreats, is trying to get the word out around the country so more girls get the opportunity to attend. This year's retreat will be held June 20-26 in Wolfeboro, New Hampshire. Applications are posted online at angelfaces.com. The application deadline is March 15, 2016. Since 2003, Angel Faces, based in Encinitas, has offered holistic retreats focusing on the psychosocial needs of injured girls. Angel Faces was the first organization to offer this kind of healing retreat, which differs significantly from burn camps. The weeklong retreat is free to participants – donors to Angel Faces pay the $4,500 per girl expenses. Angel Faces' founder, Lesia Cartelli, was herself burned severely in a gas explosion at age nine. She spent over 20 years developing and directing after-care programs for burn-injured children and adults before launching Angel Faces. Her life experiences are retold in her book, Heart of Fire: An Intimate Journey of Pain, Love and Healing. The so-called Level I retreat is for girls 12-18. Its curriculum teaches girls how to improve their self-image and increase self-confidence while embracing their trauma and related disfigurement. Licensed therapists lead sessions on trauma and loss issues, followed by activities that facilitate emotional healing through verbal expression, journaling and art therapy. The girls attend sessions on how to handle stares, teasing and unwanted questions, and do goal-setting exercises. They also receive professional instruction for applying corrective cosmetics and experience therapeutic massage and facials that help them connect with and embrace their body, for perhaps the first time. Starting this year, participants in the Level I retreat will be required to commit to participating in a year-long, online after-care program, called 'Angels in Flight,' which reinforces and builds skills learned and friendships made during the retreat. Angel Faces' mission is to provide healing retreats and ongoing support of adolescent girls and young women with burn/trauma injuries to achieve their optimum potential and develop meaningful relationships for themselves, their families, and their communities. Its board includes medical professionals such as Dr. Michael Murphy, Boston; Dr. Melanie Palm, Solana Beach, CA; and Dr. Jill Waibel, Miami. Angel Faces is a 501(c) (3) non-profit, Federal Tax ID # 20-5718594. Chicago TV Awards Now Accepting Entries! The Chicago International Television Awards is now accepting entries in over 70 competitive categories. An important part of culture around the world, television has always been a platform for inventive storytellers. For over 50 years, the Chicago International Film Festival Television Awards has been recognizing the very best in television. From outstanding commercials to dynamic programs, the TV Awards honors the greatest productions across the globe. Compete against the best in the world. Be recognized. Enter today! On Sunday, February 14th at 7:00 pm Shaker’s On Clark will host a special Valentine’s Day edition of The Couples of Shaker’s, the bar’s own version of The Newlywed Game. Couples of all types are invited to participate. Whether you’re an actual newlywed, an old married couple or just met on your favorite dating app, you’re sure to have a fun evening figuring out how well you know each other in a light, laugh-filled environment. There is no cover or fee to participate. Not ready to end the evening? Stay afterward for Shaker’s weekly Sunday night live Karaoke. Shaker’s On Clark is located at 3160 N. Clark St.
About Shaker’s On Clark: Located in the heart of Lakeview, Shaker’s On Clark is a new neighborhood bar that has quickly become a favorite watering hole for after-work drinks, late night cocktails and everything in between. In addition to over 50 rotating beers, Shaker’s massive beverage menu includes traditional cocktails and specialty martinis plus 20 different flavors of Long Island Iced Tea. Weekly events include Karaoke on Sunday nights and Late Night Dart Tournaments on Mondays. 8 big screen TV’s scattered around the bar make Shaker’s the perfect place to cheer on the Chicago Cubs, Bulls, Bears & Blackhawks or catch your favorite college team. Leap Year comes but once every four years. For Tokio Pub, this is the perfect excuse to let the beer flow! 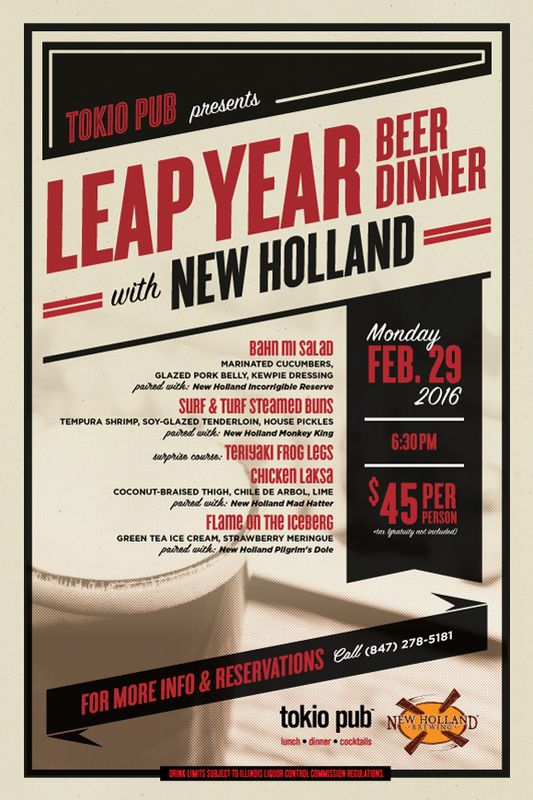 On Monday, February 29th, the restaurants is throwing a Leap Year four-course dinner (plus a surprise course) with beer pairings from Michigan's New Holland Brewing. Costing $45 per guest (tax and gratuity not included), the dinner will begin with check-in at 6:30 p.m. and the first course at 7:00 p.m. Reservations are required and can be made by calling 847.278.5181. We honor those who put imagination, creativity, and inspiration into their work. Our beer and spirits pair perfectly with a blank canvas, fertile soil, a blinking cursor, an empty plate or the hint of a spark in someone's eye. The opportunity for art is everywhere. Tokio Pub blends the eclectic flavors of Japanese and American Pub cuisine and serves them in a richly-hued dining room with lively music, friendly service, & an edgy atmosphere. Located adjacent to Shaw's Crab House in Schaumburg's Streets of Woodfield, Tokio Pub is open for lunch, dinner, & cocktails. The flavors of Japan, Latin America, and the U S of A are combined to create a unique pub menu. Try specialty Sushi, Tacos, & our Signature Hot Rock. Don't forget to indulge in the House-made Ramen Noodle Bowls or Tokio Pub's famous Angus Beef Ramen Burger. Tokio Pub is open on Mondays from 11:30 a.m. to 9:00 p.m., Tuesdays through Thursdays, 11:30 a.m. to 10:00 p.m., Friday and Saturday from 11:30 a.m. to 11:00 p.m., and on Sundays from 11:00 a.m. to 9:00 p.m. Valet parking is available for $5 per vehicle, a four seasons patio for 40 diners is available, and all major credit cards are accepted. For more info, call 847.278.5181, visit the website at www.tokiopub.com, tweet at @Tokio_Pub, join the Mobile Club (text Tokio to 30364), or keep up on Facebook at www.facebook.com/tokiopub.